Shubho Noboborsho 1426 BS. As part of the natural cycle, a year has eclipsed from our lives. We are entering into a new one. The New Year is welcomed with high hopes that it will bring prosperity and happiness for all and the failings of the last year will be buried and forgotten. The New Year will usher in new hopes and aspirations in our lives. Bengali New Year has always been an auspicious and festive event in the lives of the people of Bangladesh. People from all walk of lives irrespective of religion, cast, creed and ethnicity has been celebrating the advent of the New Year with open mind, festivities, hopes and aspirations. According to sources, the tradition of celebrating Pahela Baishakh dates back to centuries. Dividing a year into 12 months has been an old practice. The great Mughal emperor Akbar the great introduced the Bangla year in 1584 which was originally called Crop Year or ‘Fosholi Shon’. In later years, it became popular as Bangla ‘Shon’ or year. In recent years, the Nobobarsha is celebrated with great enthusiasm and wide participation in every nooks and corners of the country. Sustained economic growth and development for the last decades has further reinforced the phenomenon of celebration. The consumer spending during this festive occasion has also increased to a great extent because of increased purchasing power. In this regard the government has also played a positive role in making provision for New Year festival bonus for the employees of the state. The private sector in many cases also followed the example set by the government in this regard. The social and cultural organisations and institutions including media have played important roles in popularising the occasion and spread the festivities across the country. The technological advancement helped especially the electronic media to play a significant role in this regard. ‘Pahela Baishak’, the first day of the year starts early in the morning with traditional musical programme at the Ramna Batamul organised by the cultural organisation ‘Chayanaut’. Songs composed especially by great poets and lyricists of Begali language Rabindranath Tagore, Kazi Nazrul Islam, Dwijendralal Roy, Rajanikanta Sen and Atul Prasad Sen are rendered. People of all ages attend the programme to welcome the New Year. The Chhayanaut and its programme are inseparable parts of the Noboborsho celebration. The Chhayanaut has long tradition of organising the programme. It was first started in (1967) 1374 of the Bangla New Year. The tradition has remained uninterrupted except in 1971 when the liberation war was fought. In addition to this traditional programme, a procession called ‘Mangal Shovajatra’ is also brought out by the Institute of Fine Arts or Charukola Institute of the University of Dhaka. According to some records, the “Mangal Shobhajatra,” was first brought out in 1989. Every year, the procession or the Shovajatra has a theme that speaks about hopes and aspiration for the incoming New Year. The procession includes massive replicas of elephants, tigers, birds and masks of birds, owls and crocodiles etc. In 2016, the UNESCO has recognised it as part of world heritage and included it in ‘Representative List of Intangible Cultural Heritage of Humanity’. However, different cultural activities are organised throughout the day across the country. In recent years, these are organised even in remote villages. In the cities, every locality organise its own cultural programme participated by artists and cultural activists. Opening of ‘Hal Khata’ or new account by businessmen and traders is an important part of the Nobobarsha festivities. The traditional Baishakhi fairs are organised in different parts of the country. In these fairs traditional items mostly handicrafts and potteries are exhibited and sold. People in large number especially children along with their parents like to visit these fairs. 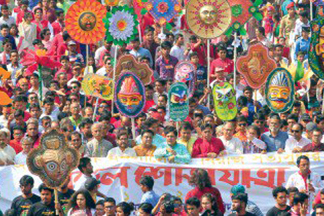 People from the Chittagong Hill districts also celebrate Pahela Baishakh with various programmes of their own. Boishukh by the Tripura, Sangrain by the Marma and Biju by the Chakma are three such programmes that mark the day. In recent years, the three communities are celebrating this day together, which is called “Boishabi.” One of the main aspects of Boishabi is a water festival by the Marmas. People also take special traditional foods on Pahela Baishak. New Year celebrations with fanfare bring new promises, expectations, hope and aspirations. With celebrations, we need to take vows and make promises to keep in the coming year. These vows and promises are to be taken at the individual and the state levels. In recent time, a number of accidents and disasters have rocked the nerves of the nation. Because of these, the issue of safety and security of the common people have come to the forefront that needs to be addressed without any further delay. The safety and security concerns particularly include the road and river communications, fire and building related disasters. Accidents in these areas have taken away lives of many innocent citizens and caused havocs in innumerable families which are to be borne for years together. In these areas, the government and its regulatory and enforcement agencies like the BRTA, BIWTA, RAJUK and city corporations and municipalities must need to take immediate steps to ensure enforcement and compliance especially of rules, regulations and codes relating to safety and security. The above will also require the willingness and cooperation of the owners. However, strong regulatory and compliance measures will ensure cooperation for compliance by the owners of the road and river transports, factory and owners of buildings and other establishments. This should be completed within the New Year. Other promises that we ought to make for the New Year are the fulfillments of the rightful demands of the common people that include the factory workers, day labourers and people working in the informal sectors, students and others. Their demands, in most of the cases, are well known to the government and the stakeholders concerned. In the area of politics, more space and right to function more freely of the political parties should be respected. In this case, the politics of tolerance, mutual respect and harmony should be promoted. In the economic front, growth and development must be ensured with appropriate policies and actions. Here it may be mentioned that in the recent years the gap between the rich and poor is widening in Bangladesh. As such, a promise could be made in the New Year to address the issue of equity and distributive justice. These could be done through policy initiatives and affirmative action of the government and the business community. Maintaining communal harmony is important for peace and economic growth and development. On many occasions, human rights especially of the religious and ethnic minorities are violated by some vested quarters. In the ensuing Noboborsho, as a nation, we need to take a collective vow to safeguard the human rights of all irrespective of religion, caste, creed, ethnicity and political affiliation. Here it needs to be remembered that the celebration of the New Year is of course very important but at the same time we also need to take vows and make promises to make Bangladesh an abode of peace and prosperity.